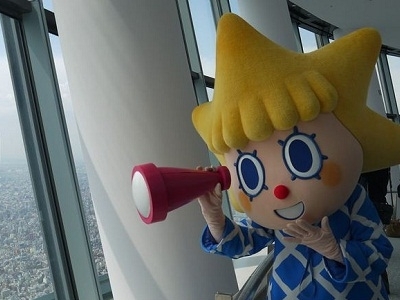 There are 5 ways to purchase tickets to TOKYO SKYTREE Observation Deck. 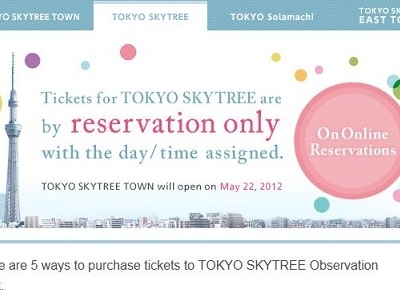 1.Online advance reservation of "TOKYO SKYTREE Web Ticket" starts from March 22 (by drawing). Credit cards issued in Japan is required for online reservation..
2.Advance purchase may be made at Tobu Travel Box Office from March 22 (by drawing)..
3.Tickets from May 22 to July 10 are by Advance Reservation Only. No day tickets will be sold during this period. Day tickets will on sale from July 11.. 4. "TOKYO SKYTREE Group Reservation Center" takes reservations for groups of 25 or more..
5.Use travel plans of various travel agencies or accommodation plans offered by TOKYO SKYTREE Official hotels/TOKYO SKYTREE Friendship Hotels. .